Classification – "Expertise, Right Across the Board"
The evolution of the conformal coating over the last 50 years has led to a large range of conformal coatings with many different variations. 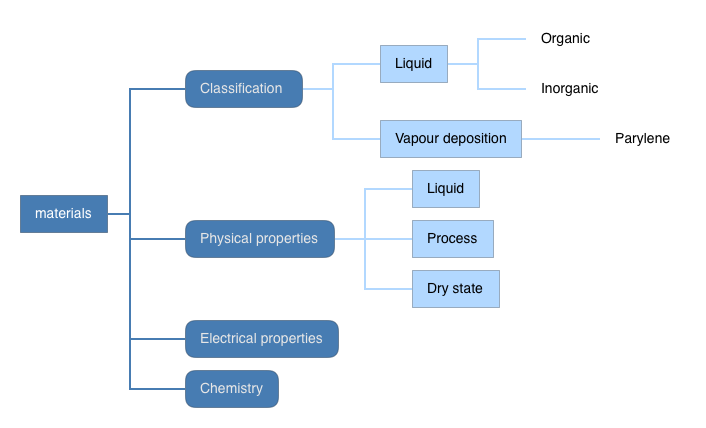 The family tree below shows these common conformal coating materials normally found split out based upon the properties and types. The different conformal coating families can be subdivided by their different properties and types. Liquid conformal coatings are the traditional materials that are similar in appearance to varnish and applied using a variety of methods including dipping, spraying and brushing. The liquid conformal coatings can be further divided into organic, inorganic (silicone) and fluorocarbon families. The vapour deposited coatings are the Parylene range of coatings and some Fluorinated Polymer Coatings. The liquid conformal coatings can be further subdivided into organic and inorganic chemistry. The majority of conformal coatings used in the world are made of organic coating materials. This includes the Acrylic and Polyurethane conformal coatings used in all fields of protection. Fluoropolymer coatings are also included in the organic coatings group although separated for ease of understanding. Silicone conformal coatings are inorganic coating materials. They are polymers in which atoms of silicon and oxygen alternate in a chain. Conformal coatings can be sub-divided further by defining their cure mechanism. These cure mechanisms include solvent evaporation, heat cure, UV cure, moisture cure and catalysed cure. All except the acrylics are “cured” by an irreversible polymerisation of the resin by crosslinking of the polymer. The acrylic resin does not polymerise (does not cure) and actually just dries out. This means the coating can actually be redissolved back up in the evaporated solvents and reform the coating. Most conformal coatings are supplied as single part materials. This means the coating does not need to be mixed before application, except for potential adjustments of the viscosity with solvent addition. Two-part coatings are coatings that are supplied as two separate parts, A and B, that are then mixed together to create the final coating for application. There are process disadvantages to using two part materials, which are balanced against the potential coating benefits offered by the two-part product. Solvents and other liquids (eg water) may be added to dilute the conformal coating to adjust the viscosity for application. Most solvent free coatings do not require adjustment but may require alternative equipment due to their viscosity range. Further, the application technique may require no carrier liquid for the monomer such as Parylene XY. Finally, each conformal coating will have its own physical and electrical properties, both in the wet and dry state, that offer flexibility in selection of the conformal coating. These are investigated further in later chapters shown in the links below.